Charlotte’s Christmas countdown has begun! Hello again! The first half semester is over and done and I don’t think I could’ve possibly crammed any more in than I have. Taking it back a few weeks, I volunteered to help out at an open day for potential new students and ended up becoming a Student Ambassador. That basically means that you’re still more than likely to see me wandering around on open days and similar events, just with a uniform. We did our second open day not too long ago, I got quite stuck in and ended up doing my first accommodation tour and course introductions which was actually quite strange, given I remember the people who took me around this time last year and now it’s me doing it! 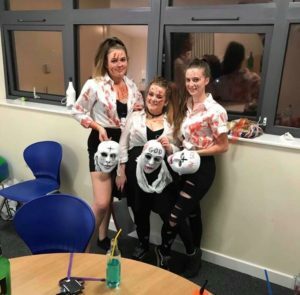 Recently, we had our annual Halloween Ball which was fancy dress (we also hold a Winter Ball and a bigger Summer Ball at the end of the year) and was very busy. Me and my friends went as people from, the film, The Purge; which worked quite well! We’re now on the run up to the Winter Ball which is on the 12th December and is more formal so we’re considering doing a run out to the Trafford Centre to try to find formal dresses. Click here to check out the pictures from Halloween Ball! Then came reading week, which is effectively half term. Most people went home for a well needed rest, myself included. I took two of my friends with me and introduced them to Manchester, and when we came back we basically had our corridor and most of the building to ourselves. It was an interesting week to say the least, with one day spent trying to get back into my friend’s car after she managed to lock her keys in there. In all fairness it had been a busy night, so it’s not surprising she forgot to take the keys out of the ignition really. I’m starting to realise there’s no such thing as a quiet day when you have friends as accident prone as I do! My assignments are well and truly underway, I’ve submitted my first and received the feedback; half of which went surprisingly well and the other half I have room for improvement. I know what to do for next time as the feedback is very thorough. I have another four due in before Christmas so the workload has been ramped up a bit, but they’re all in at least a week after one another so I have time to focus on one specifically before it’s due in. We’ve not yet convinced one of my flatmates to get festive yet (she’s effectively the grinch) but I’m working on it. I WILL get her in a Christmas jumper if it kills me, which it just might. Me and one of the other girls have gone a touch overboard on the Christmas decorations, my room resembles a tinsel factory and she went all the way and bought a tree for hers but we love it. It did perhaps go a step too far last week when a friend (dressed in an elf Christmas jumper and matching hat with tinsel tied around her head) decided to sing the chorus of walking in a winter wonderland at the top of her lungs whilst being dragged down the corridor in her ‘sleigh’ (a cardboard box.) Living with these girls is nothing if not entertaining! 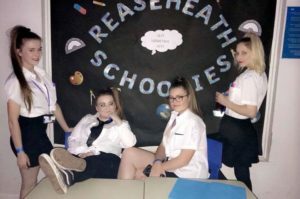 The student life here at Reaseheath is mad, you really get a totally unique experience which I personally love. We are sort of like our own little community in a way. The last social was ‘Schoolies’ which is exactly what it sounds like. Myself and my friends love getting into the themes, so we went in white school shirts & black skirts and ended up getting people to sign our shirts like we did when we left high school. It was another good night, with some fab throwback songs and the best part about it is, is that it’s on site so you can quite literally wander home and roll into bed in the space of about 5 minutes. That’s all for now, wish me luck trying to help the girls find formal outfits whilst get four assignments in. It’s going to be a very busy month! I’m Charlotte. 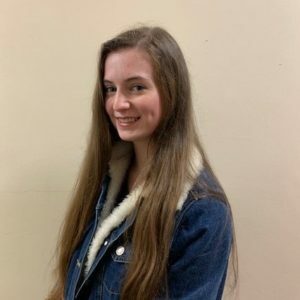 I’m 20, have come from Manchester and have just started the first of three years on my course, BSc (Hons) Equine Science. I have been around and owned horses for the majority of my life and am passionate about all things equine so it made sense to continue my passion into a career. I live on-site in Platt Halls, which is in my opinion, easily the best halls (though I may be a bit biased). Settling in was my biggest concern, having never lived away from home before. I needn’t have worried. Check out my previous blog here!